We are available 24/7 to provide you with a non-binding and free price estimate for our cleaning service. Just contact 020 3746 1366 or use the online contact form! We are among the first carpet cleaners in Rayners Lane HA2. Since we first started business, Ashlee House Cleaning has worked hard to develop into a leading and top preferred carpet cleaning service in the area. Our professional cleaning services company works with a growing number of business and private customers. We will safely clean all types of carpets and a special fibre protection can be applied. We work with and invest in the most advanced professional cleaning technologies, methods and solutions, because the 100 % satisfaction of our clients is our main priority! To increase the long life of your carpet, and to get it look like it is brand new, book our expert carpet cleaning service today! We use the most efficient carpet cleaning methods to guarantee that your carpets and rugs are properly cleaned, all allergens, dust mites, dust and dirt are removed, while at the same time - the carpet remains safe and undamaged. Every carpet session starts with an examination, testing of the detergents which will be used and hoovering. Only after that our professional carpet cleaner will proceed to deep clean the carpet. When steam carpet cleaning is performed, the cleaners use a professional hot water extraction cleaning machine. This technique is perfect for durable textiles. 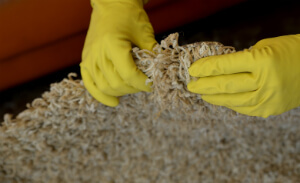 For more delicate carpet and rug materials, we offer dry carpet cleaning in Rayners Lane. Our cleaners use special instruments to apply and embed special dry cleaning powder in the fibres of the carpet. It is left to stay there for some time and then it is removed with a powerful vacuum cleaner. Together with it, any dirt and dust are removed. Our deep carpet cleaning is suitable for both synthetic or natural carpets. Ashlee House Cleaning has been providing professional carpet and rug cleaning for commercial and domestic properties as well to the residents of Rayners Lane HA2 for over 10 years. We work only with vetted, trained and recommended cleaners, who are equipped with the latest expert cleaning technologies and with safe and yet highly efficient cleaning solutions. Our cleaners are experienced and trained to clean any kind of rug or carpet, and to remove a wide variety of different stains, such as: blood, oily stains, paint, coffee, wine, rust, tea, vomit as well as repair moth damage. You can call any day of the year for our carpet cleaning experts in Rayners Lane HA2 to visit your domestic or commercial premises and deep clean any type of carpet. We have bank holiday and weekend availability. The earlier on you book, the better the price you get. Call 020 3746 1366 or send us an online request. The operators are available 24/7 to process your order in up to 2 hours. In cases of emergency, we can come on the same day. We have affordable prices for our expert carpet cleaning service. If you book more than one service at once, you will get a discount. Regular customers, estate agents and landlords enjoy preferential rates. Let us clean your carpets to excellence - book with us!